Sony PlayStation-4 game console has gained lots of popularity since the very first day of its release. This innovative game console has a tremendous number of audience and an incredible number of amazing video games ready to download/purchase. But there arises a serious problem with the limited capacity of the default/standard PS4 Slim hard drive that has been recently upgraded to 1TB by the factory itself in the new release line of PS4 Slim. But that amount of capacity is still not enough for a variety of users who look for a much bigger storage potential. There are two different solutions to work around this problem—either upgrade your internal hard drive to a bigger size or get an external hard drive instead. We will be addressing both methods in this guide and make some recommendations at the end for the PS4 Slim external hard drives. In this section we will list what we consider to be the best external hard drive for PS4 Slim game console for year 2017. These drives feature high quality products of the most prominent firms in the storage device industry. We only authorize Seagate, WD, Hitachi (which has been owned by WD since a few years) and Toshiba. Also, we gave the year of production (not before 2013) and term of warranty (not less than 2 years) our top priority along with the rating each particular drive gained on Amazon website. The Backup Plus Fast is by far the speediest and highest-capacity hard-drive-based USB 3.0 portable storage device to date. This latest member of Seagate’s Backup Plus family of compact external hard drives achieves that by combining two internal hard drives on the inside in a RAID 0 configuration, effectively doubling both the current capacity and performance. The Seagate Backup Plus Slim is the space-saving version of Seagate’s performance-heavy mobile portable family and is the thinnest portable hard drive on the market. The Backup Plus Slim Portable Drive is the simple, one-click way to protect and share your entire digital life. At 12.1millimeters thin for up to 4TB of capacity, it’s ready to take with you and go. Samsung now offers a portable hard drive (the P3 Portable) with up to 4TB of storage. The P3 keeps Samsung competitive in the market as brands continue to offer this capacity in a portable drive. Samsung puts an emphasis on the P3’s design and small size (it is one of the thinnest portable 4TB drives available). The P3 uses a USB 3.0 port to perform data transfers. Just until few weeks ago, Sony used to release PlayStation-4 with a 500gb hard drive capacity which doesn’t meet the expectations/ambitions of a wide variety of enthusiast users who stay hours daily playing different games on PS4 Slim. The heaps of complains Sony received of the limited storage capacity of PS4 Slim’s default hard drive forced the manufacturer to release a new version of PS4 Slim with an expanded 1 terabyte of storage capacity. But again the enthusiast gamers find that capacity too limited for their ambition. So what’s the workaround for this problem? How can the enthusiast users download all their favorite PS4 Slim games and save them on a continuously handy storage device that provides an instant access to all your favorite games on the fly? The answer is simply that you either upgrade your internal PS4 Slim hard drive to a 2tb capacity, or even 1tb if you still use the older version of PS4 Slim [Check our 1tb and 2tb PS4 Slim hard drive recommendations] or, if you feel that size is still not sufficient for your needs, you better get a large external hard drive (up to 4tb), which features, along with a large internal hard drive, a pretty much enough space that can serve your needs for a few more years. PlayStation 4 System allows users to add external hard drives as a storage extension to the system storage, or just as a backup storage with which you can take a precautionary copy of your installed games. This important feature gives a high flexibility to this console and gives a way out of the stress caused by the limited capacity of the default internal hard drive of PS4 Slim. So now you can download and save whatever digital material for your game console as long as you have an external expansion ready outside the box. You have to be aware that using an external hard drive as an extended storage on PS4 Slim means you won’t be able to use it on other systems because PS4 Slim will format and encrypt your external hard drive with special file system that can be only read on PS4 Slim. You won’t also be able to use the external hard drive for backup purpose or playing movies on it (read more about that here). This may be the only major disadvantage of using an external hard drive on PS4 Slim consoles. Otherwise, to most users who have upgraded to a 2tb PS4 Slim internal hard drive this should not be a problem at all. So if you decide on going with an external hard drive for your PS4 Slim, there are a few questions you need to ask yourself first, something like: How to choose the best external hard drive for your PS4 Slim in terms of performance and reliability? What kind of external hard drive suits you better—a desktop or a laptop external hard drive? What capacity do you really need and how can you take the utmost advantage of your current PS4 Slim internal hard drive without just trading it for a new one? These questions and others (which we will be addressing in this guide) are important to contemplate on before you decide on your situation with the limitation of PS4 Slim storage. In fact, there are no many options in the external hard drive realm you can choose from for your PS4 Slim game console, and what you see in our list is all based on our research to bring to you the best external HDD brands for PS4 Slim on the market. Do You Really Need an External HDD for PS4 Slim? The Internet abounds with lots of appealing materials to download and store on your PS4 Slim hard drive, particularly games and movies. While a modern PS4 Slim game, such as GTA 5 would cost you about 41GB of space just to store it, and almost 48.7GB to install it (i.e. that’s approximately 90GB of engaged space for just one game on your PS4 Slim internal hard drive), the Ultra-HD movies come in similar size (For example, Mission Impossible 4K UHD 2160p is 45GB of size). And unless you are like that guy who disposes of every movie and game he downloaded by deletion after watching/playing it, you’ll find yourself stuck with the very limited space a standard PS4 Slim hard drive provides, and you’ll easily come to the conclusion that even a 1tb will not suffice after few month of usage, and here arises the need of an extra storage device that can handle the heaps of your downloaded digital stuff. If you lack free space on the internal hard drive of PS4 Slim, you will need then to either free up space on it or just expand its storage capacity following one of these five methods. Make sure to download the latest PS4 Slim system software to take full advantage of your external hard drive. With the use of external hard drive as an extended storage, you can expand the system storage to up to 16tb (read more). Laptop external hard drive. It’s portable and small and doesn’t need a power cable to launch it. It has two types: Single drive and dual drive. The latter provides doubled speed of the first. Desktop external hard drive. It’s larger in size because it utilizes a 3.5-inch desktop hard drive. It’s faster and more reliable than its laptop sibling but its larger size, heavier weight and the need of power cable repel most users from adopting it. It comes also in two types: single drive and multiple drive which can be 2-4 drives connected to each other via RAID array inside one box. PS4 Slim will not make any big use of the high speed of the external SSD. That’s because the PS4 Slim internal hard drive is already too slow compared with the speed of the external SSD which will remarkably hinder the transfer process between the two storage devices, and the HDD will rule here not the SSD. 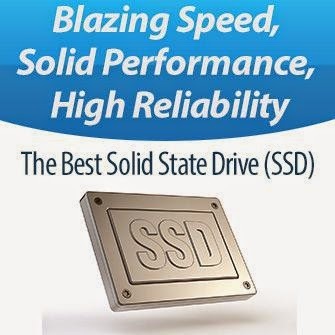 You may read more about external solid state drives (SSD) here. USB Flash Drive. Its main disadvantage is the limited small capacity and the unreasonably exaggerated price for capacities above 256gb. If you prefer this type of external storage, you may want to read our USB 3.0 flash drive guide. It may intrigue you to know the advantages and disadvantage of each type via a comparison table. This can give you a clearer picture of what external drive suits you best. In the table below we are comparing two external hard drives that are considered the best of their class. The desktop external drive is Seagate Backup Plus 5TB Desktop External Hard Drive (STDT5000100) [Single Drive] and the laptop external drive is Seagate Backup Plus 4TB Portable External Hard (STDR4000100) [Single Drive]. Note that the benchmark numbers have been acquired from storagereview.com. The below table features a comparison between two types of external dual hard drives, one is unportable (desktop) [WD WD My Book Duo] and the other is portable (laptop) [Seagate Backup Plus Fast Portable]. What Type Do We Recommend? As you can already notice, the external dual hard drive is faster by almost double the speed of the single drive. We would strongly recommend this type of external drives only to professional users who have tons of data to download and save everyday. Otherwise, a regular PS4 Slim user should be fine with an external single hard drive. Compatibility All of the external hard drive in our list are compatible with PS4 Slim operating system. They are interfaced with USB 3.0 and can be formatted to work seamlessly with PS4 Slim without any single issue. Portability. This is not a big issue if you want to exclusively use the external hard drive for backing up your files from PS4 Slim. If you have enough space for a desktop external hard drive, I would only recommend it to you, as it’s more reliable and faster than laptop/portable drives. Otherwise, a portable hard drive should be fine with you, as the “more reliability” of external desktop hard drives doesn’t make the portable ones bad or unreliable. It’s just a relative matter. This is a great option for PS4 Slim enthusiasts for the high speed it boasts. It’s configured with RAID 0 to offer the best possible performance that comes next to an SSD. This is strongly recommended as a compromise between price, capacity and speed. This is the second external HDD recommendation for PS4 Slim. If you just want a regular external hard drive with an overall good performance, this drive is for you. It’s equipped with USB 3.0 interface and offers a capacious data storage up to 4 TB. WD My Passport is a prominent brand in the external hard drive industry. With the USB 3.0 connectivity and the high speed it offers, this can be a good alternative to the above choice for PS4 Slim Users. Samsung is not well known in external hard drive segment, it mostly focuses its efforts on external SSDs instead. With this release, Samsung has proven that its external hard drive is solid enough to be selected as one of the top external hard drives for PS4 Slim. What about PS4 Slim External Hard Drive Compatibility? Many old PS4 Slim users who live with the outdated firmware software of PS4 Slim still think that they cannot use an external hard drive on PS4 Slim, or if it’s possible then it’s a matter of difficulty due to compatibility issue. This could have made a valid point if we are living 2 years back when Sony first released its PS4 Slim console without any support for external storage devices. But now this is a matter of history. You’ll not have any compatibility issue at all when you add an external hard drive to PS4 Slim. 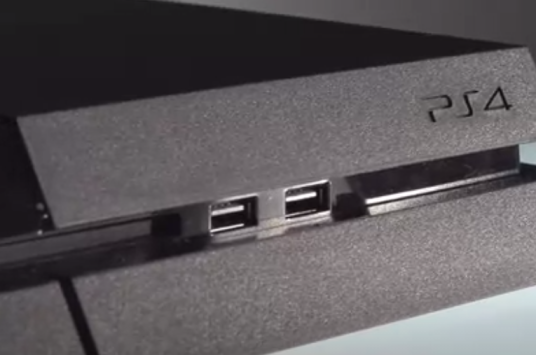 Just follow the next section in this guide to learn how to use an external HDD on PS4 Slim. After Sony released PS4 Slim System Software 4.5 It’s now possible that an external hard drive is used to install games on it and play them directly from there. This is only possible if you have set up the external hard drive as an Extended Storage. We don’t recommend to everyone to use an external hard drive as an extended storage on PS4 Slim for some valid reasons. You can read a lot more about that in detail in this article. Backup your data on the internal hard drive. Play media files (like movies and audios) directly from it. So now, you have got an external hard drive for your PS4 Slim, how to use it? Using it is very simple, just follow the steps below and you’ll be done. But before going through our short guide, make sure you have downloaded and installed the latest firmware update for PS4 Slim. This is an essential step to carry out. Then you must format the external hard drive to make it compatible with PS4 Slim. Download “PS4 Slim Media Player” from the PlayStation Store (there will be an icon on your PS4 Slim’s home screen so you don’t have to search through the Store catalog), and let it install. Load up the newly-installed PS4 Slim Media Player. Now your external hard drive will appear in the list of playable media, and you can select what you want to watch. At the end of the day, after Sony released its PS4 Slim firmware update that allows the use of external hard drive on PS4 Slim, an external hard drive has become an essential accessory to all enthusiasts who have large data to regularly backup, or have tons of movies they wish to play externally without the need to download them directly on their internal hard drive.